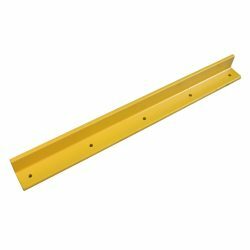 The BHS Protective Rail (PR) is a heavy duty guard angle system which protects battery handling equipment and racking against damage at floor level. The PR is available in 3′, 4′, and 5′ lengths (0.91 m, 1.22 m, and 1.52 m). Anchors are not included. If PR is being used in front of Single Level System Stands (BS-SL) with an Automatic Transfer Carriage (ATC) that is utilizing a host truck with 60” (1524 mm) forks, an application review should be completed to verify there are no issues reaching the batteries on the stand. Hardwood Battery Station (HBS) units with Drip Pans should only use PR-4. The PR-6 is not recommended for this application because the pans cannot be removed as intended. PR should not be used with the Roller Wash Station (RWS) or Hardwood Wash Station (HWS) as the Drip Pan cannot be removed at all. Use the BHS Protective Rail to guard your valuable equipment and comply with OSHA Standard 1926.441(b)(2), which requires “charging apparatus” to be “protected from damage by trucks.” Contact our sales team at +1 314 423 2075 to learn more or to find a local dealer.